Hey everyone! We are super excited to announce a tour we're hosting for PLATFORM DWELLERS by Katarina Boudreaux which releases on May 8th! We are totally stoked for the tour for PLATFORM DWELLERS this April/May! We can't wait for everyone to read it! On the remnants of oil platforms in the Gulf of Mexico and Dauphin Island, Joe is a typical Nob Platform teenager, except that her Mom left a year ago for a more social Platform, and her Dad sometimes forgets she exists. But she knows she wants a career in Communications, so her high school senior project “See-Saw” focuses on long-distance underwater connections. Drayton, Joe’s best friend, discovers lights moving on Land at the same time Joe picks up SOS signals with her See-Saw. 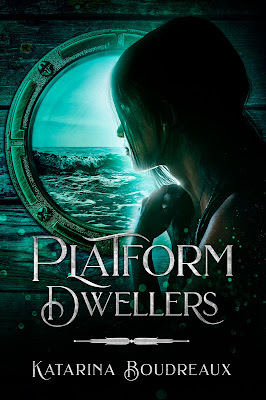 Though Land has been silent since technology was destroyed during the Moralist Revolution, Joe and Drayton discover that the Platform Planning Commission (PPC) seems to be ultimately responsible for the Bone Virus that precipitated the Revolution. They enlist the help of Flox, a debunked scientist, to take them to Land to investigate the remnants of human Land society—before the PPC can stop them. What they find on Land will forever change the course of their lives and the lives of all Platform Dwellers.